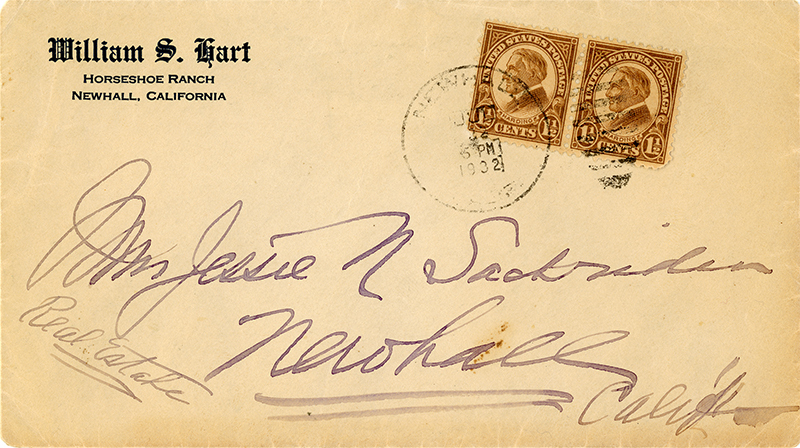 SCVHistory.com JF3201 | William S. Hart: Instructions to Real Estate Agent Jessie N. Sackrider, 7-22-1932. 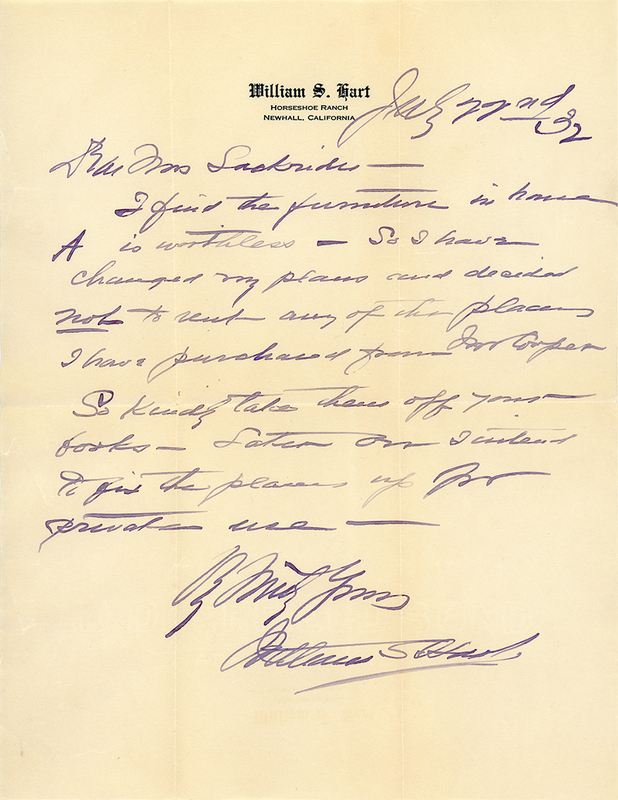 Handwritten letter from William S. Hart to his real estate agent, Mrs. Jessie Nourse Sackrider, dated July 22, 1932. Horseshoe Ranch letterhead, parchment, 8½x11 inches, pen and ink (probably fountain pen). Back is blank. Envelope (below) postmarked at Newhall the same day, 3 cents postage. I find the furniture in house A is worthless. So I have changed my plans and decided not to rent any of the places I have purchased from (Wm.?) Cooper. So kindly take these off your books. Later on I intend to give the places up for private use. Hart amassed his Newhall property (most but not all of the current William S. Hart Park) piece by piece over a number of years, as detailed here. Considering the timing of this letter and the name, Cooper, we can guess the letter probably pertains to one-half of Lot 15 of Tract 1059 on the west side of his ranch, close to Market Street (circled on map), which property he purchased from Alphonso G. Cooper (or Cooper's heirs) on June 23, 1932. If so, the letter affirms there was a house on the property, a fact about which historians previously were uncertain. 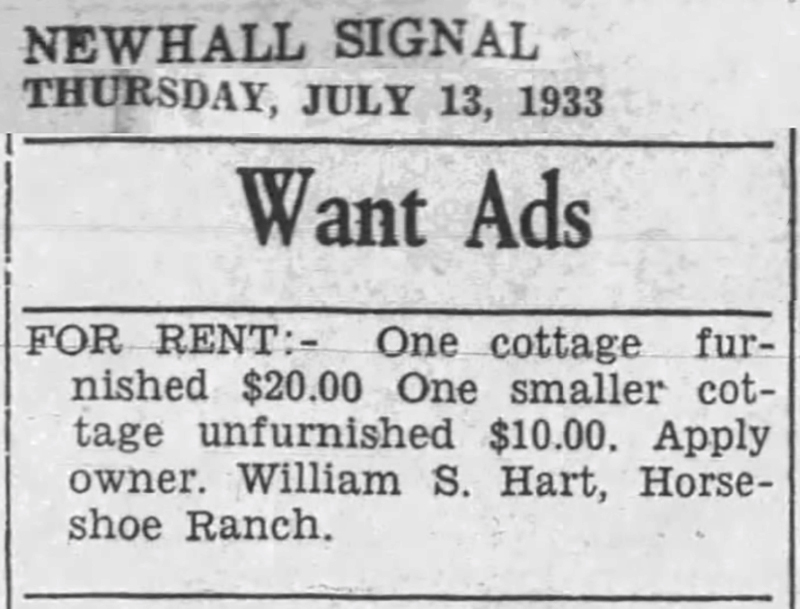 Hart advertises two cottages for rent in The Newhall Signal of July 13, 1933, one furnished, one not; they are probably the "places" he changed his mind about renting on July 22. The letter comes to us from Jessie Nourse Sackrider's grand-niece, Claudia "Jeanne" Feeney, who was managing editor of The Newhall Signal in the 1980s. Feeney's mother, Jean Glass Potter (1916-1987), a newspaper reporter who married her editor in 1949, was Jessie's niece. Both Jessie and her niece hailed from Enid, Oklahoma. Born November 20, 1876, Jessie had come to Newhall in 1923 with her husband, Don Harold Sackrider, a World War I Army veteran. "He was suffering from tuberculosis, which doctors felt would be relieved by the air and climate," Feeney writes (2018). We don't know where the couple lived; the Wildwood Sanatorium in Happy Valley, a community for tubercular patients, didn't open until 1926. Don Sackrider didn't last that long. Following Don's death in 1924 at age 36, his widow established a real estate, insurance and notary business, which she began advertising in The Newhall Signal in early 1925. 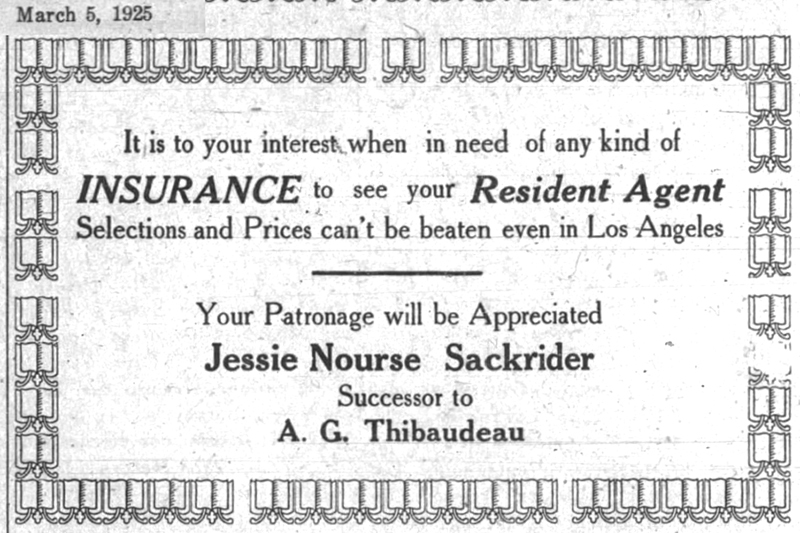 Apparently, Jessie picked up the insurance license held by A.G. "Bert" Thibaudeau shortly before his death on March 17, 1925 (The Signal, March 5, 1925). By this time, Thibaudeau's widow, Armantha, had started selling some of their property east of Market Street to William S. Hart, whom Armantha Thibaudeau considered a friend. Jessie handled both real estate sales and property rentals, which explains why Hart would have retained her to manage his properties. On June 4, 1925, The Signal reported that Jessie Sackrider was "moving into her new home on 2nd and Race streets which has just been completed." She would own the home for the rest of her life. When the county renumbered all of the local street addresses in the 1950s, the address became 22221 W. 2nd Street, phone number Newhall 906. 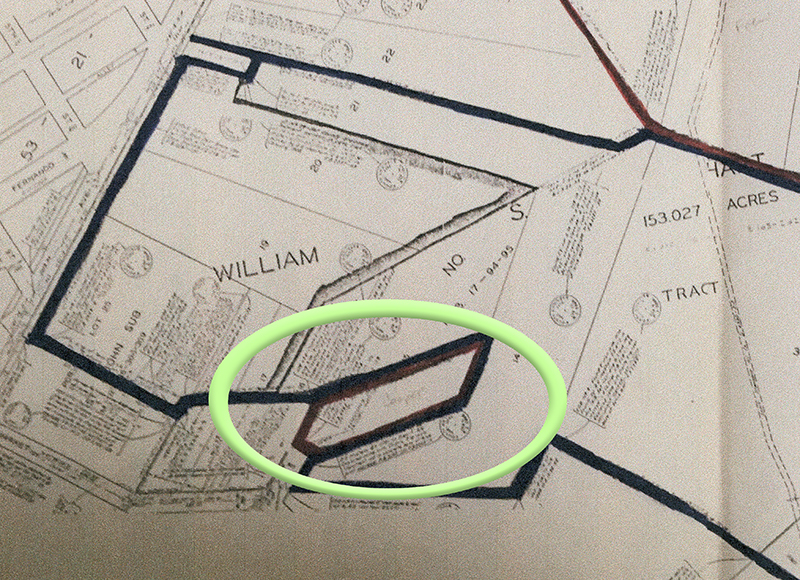 It appears the house still stands (2018); L.A. County Assessor records show a 1,081-square-foot house with a construction date of 1927 on the property, which is now numbered 24042 Race Street. Jessie quickly became an active community participant, professionally and otherwise. In the fall of 1925 she led an effort to bring nine new streetlights to the east side of the railroad tracks that were sure to "make a big improvement in that part of town" (The Signal, September 10, 1925). In 1929, the officers of the Saugus Community Club were "much pleased" with Jessie's promptness in getting them an insurance settlement of $762.03 just two weeks after a fire wrecked their clubhouse at what is now 23027 Drayton Street (The Signal, September 19, 1929). The fire was attributed to spontaneous combustion when a "box of old shoes which had been left under the floor" ignited, "the terrific heat of the past few days giving it the necessary impetus" (The Signal, September 5, 1929). As a notary public, Jessie notarized many interesting documents which would be considered historic today, such as a 1930 "statement of ownership" declaring A.B. "Dad" Thatcher to be the "publisher, editor, managing editor and business manager" of the Newhall Signal and Saugus Enterprise. It identifies the sole owner as Blanche B. Brown (The Signal, April 10, 1930). This is going to require some further exploration because it was previously believed that Brown, widow of the original owner, sold the paper to Thatcher in 1925. Jessie's real estate office was originally located at the corner of Market Street and Spruce Street (now Main Street). We don't know which corner, but it must have been the northeast corner, because in 1926 she leased the property to developers of a gas station and "moved across the street next to the library" (The Signal, May 27, 1926). The northeast corner was occupied much later by Soundsations. In 1932 she moved her office into a larger space "across the street to a lot adjoining the telephone office" at 627-629 Spruce Street (The Signal, February 11, 1932), which she "greatly improved with a couple of additional rooms, besides a new roof. A new sidewalk in front is another improvement" (The Signal, February 25, 1932). Jessie's mother (née Sprague), who lived in San Fernando, was helping out in the business at the time (The Signal, January 28, 1932). Jessie's new office complex on the west side of Spruce (now Main) Street between Market and 6th streets housed the circulating library, which was owned and operated by Jessie E. Richards, as well as the law office of attorney C.M. Delameter. In The Signal of July 7, 1932, Jessie gave thanks to "A.L. Palman, the safe wizard as well as builder, McVey the sidewalk man, Harry Rogers, decorator, Bowman, Bozonitz and Willard for electric and plumbing, (and) Walter McIntyre, stucco artist." The safe would get another mention two months later when a burglar cracked it but found only paperwork. Under the heading, "Burglar Must Write," The Signal reported (September 22, 1932): "Finding nothing of particular value, (he) took the typewriter and departed." The burglar overlooked a valuable rug. Jeanne Feeney, Jessie's grand-niece, remembers the safe. She writes (2018): "Jessie Nourse Sackrider had her office in town forever, and when she closed it, my mom hired a convicted safe cracker to open (the safe). It was a huge black thing with gold decorations. He told me you have to listen to the lock." 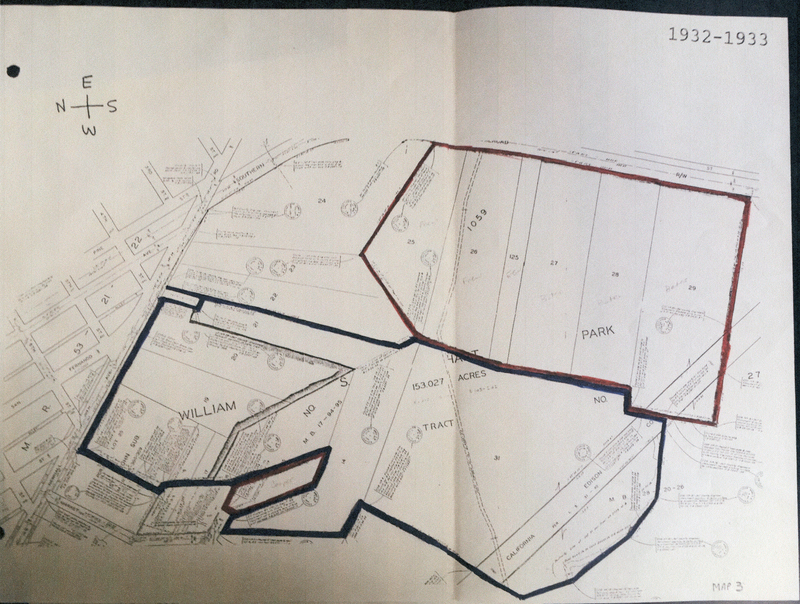 Jessie Nourse Sackrider owned several additional commercial frontages and rental homes in the area, all of which were sold by her estate shortly before her death on January 26, 1966. She was 89. JF3201: 9600 dpi jpeg from original letter and envelope courtesy of Jeanne Feeney.